As you surely know by now, the landing was successful, marking another triumph in NASA’s exploration of the Red Planet. Here are the critical three minutes of the entire hour and a half NASA 360° video. Positioning a 360° Camera is always challenging when shooting a large group of people but this was well done. The JPL crew missed their Thanksgiving holiday this week in preparation for the InSight landing. 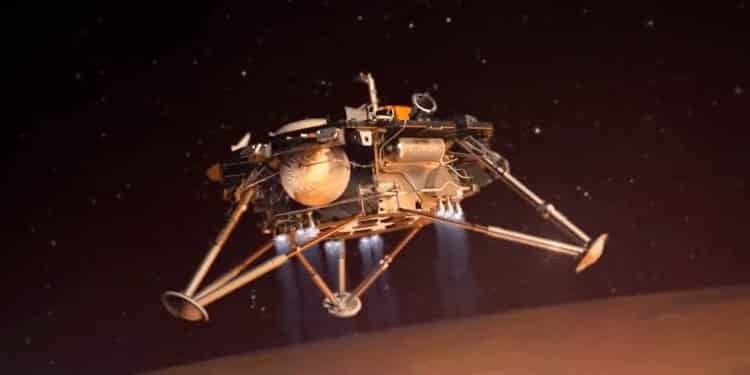 You don’t need a 360° camera to sense the sighs of relief after a half-year journey and six minutes of deafening silence as the lander streaked through the Martian atmosphere. If you’re interested in what the new Martian rover can do, NASA has details on its mission and major instruments with a useful 3D visualization. These images show just how critical it is that we move beyond textbooks (whether printed or online) with static reproductions. The next generation of students will never understand how we lived in a world of images you can’t manipulate. Similar to the way we feel in watching a silent movie and marveling at how you told stories without audio. Speak of images . . . InSight sent back an image of its new home even before the lens cap came off its camera). A little blurry and dust-specked – there’s much more to come. It will be a while before we have anything like NASA 360° videos from the surface of Mars, but expect InSight to offer a treasure trove of data and 360° images. With immersive tech leaping ahead, we’ll be on Mars in virtual reality before someone actually steps foot on the planet. Getting there virtually is just fine with us. The magic of space exploration never grows old.